This is hilarious and great to see. Hornik announces the return of VentureCast - download the first one here. It aims to be a truly "stream of consciousness podcast" recorded while he drives up and down Bay Area highways. We look forward to hearing more Dave. Keep 'em coming. How many conferences and events can one person be at -- simultaneously in various cities on the same days? September through November are insane months for conferences....this week alone, there was Digital Hollywood, the Future Imaging conference in Monterey, Blog Business Summit in Seattle and there are a couple of smaller east coast events I didn't even have time to explore, not to mention PhotoPlus next week in New York. I blogged a bit about Digital Hollywood yesterday and plan to post my thoughts on the viral and organic marketing session within the next 48 hours......while in LA, I missed the blogging event in Seattle, where the likes of Jason Calacanis and John Battelle spoke this year, among other key Web 2.0 industry folks. For the latest activity at the blog summit, check out this live blogging link to keep tabs on the sessions and insights. Forrester Research is having a two-day Consumer Forum: Humanizing the Digital Experience in Chicago on October 24-25, 2006. You can register here. (there are different rates depending on whether you are a Forrester client or not). * How are mobile devices and social computing — such as blogs, RSS, and social networking — changing consumers' expectations of the digital experience? * How does the convergence of digital and personal environments — as in the cases of networked homes and socially connected, device-loving teens — change consumers' expectations of brand marketing? * How should companies use technologies to create emotional connections with consumers? * Which emerging technologies — interactive TV, video, mobile devices, behavioral targeting — hold the most promise for creating a more "human" digital experience? * How does technology help retailers and consumer products manufacturers humanize the brick-and-mortar shopping experience? * What are examples of digital content, function, tone, and imagery that appeal to consumers' emotions? * How do brands stimulate word-of-mouth marketing through entertaining, intuitive, or otherwise "human" experiences? * How do companies monetize the value of a good experience? Client KnowNow spoke at the Future of PR event in New York today, which I blogged about a week or so ago. Think it odd to have an enterprise RSS vendor speak on a PR panel? You shouldn't. It is an industry that could dramatically benefit from internal and external RSS. From what I can tell, its a downloadable app only, and works like an aggregator.....but because its not available on the web, it doesn't look like you can synch or keep track of your feeds while you're on the road. Yet, the UI is clean and better than a lot of the aggregators I've tried to-date. And great clean and beautiful UI DOES matter to some of us. In addition to the keeping track of news feature, there's also a cool Annotate feature that lets you draw anything on photos and share them without altering the originals. I've been playing with Google Analytics over the past week. Ed Batista has a comprehensive post on how to integrate it into your Typepad blog. * Average Score: links with the highest average score are those links most commonly visited prior to high-value conversions during a visit. Chris Anderson's newly published book, The Long Tail. Yes, I actually finished it. The primary focus at the beginning was centered around traditional retail markets versus new long tail markets, and how and why the old 80/20 rule is now a 98% one. Anderson talks about existing products and services that have tapped into the Long Tail phenomena and are achieving significant revenue from the sellers at the bottom of the list. Online distribution models, more choice and the ability to find the obscure has contributed to this shift. 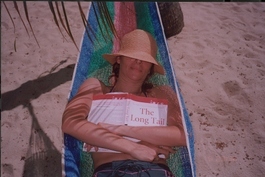 Like some of the recent social media and Web 2.0 books I’ve finished in recent months, the Long Tail was a must cover-to-cover read given the fact that so many long tail businesses have a direct impact on my consultancy, not to mention my clients’ products and services. Early on in the book, I found myself wondering about a different impact of this e-evolution (made this up). For example, we see evidence of success from large players where the 98% rule applies and is working – eBay, Amazon, Rhapsody, Apple, Real….yet given the focus on emerging niche markets, I started to contemplate how obscure the service or product could be and still have a successful long tail outcome. Take a local wedding planner in a mid-west town, who is currently only servicing her immediate area. While her service may currently be best served in a local market, she could start to offer sub or related wedding planning services, which could appeal to a much wider audience. And now, she has the ability to reach that audience in ways that were previously just not compelling. Or possible. In other words, she could develop a very obscure niche that may have more appeal in the south than her own region. And so on. How obscure could the market go and still reap benefits of the Long Tail? What might that look like and how creative will the creation be? What would a future look like if Long Tail market success continues at this rate, in a world where distribution and availability to endless content prevails, here and abroad. What about developing countries where the trickle effect has not yet been realized? Isn’t it inevitable? The creative outcome might be really interesting in a place where they missed a trend or phase we already passed through or are still in the middle of, i.e., TiVo, Napster, AOL chat, Rhapsidy, MusicMatch, etc., and suddenly they have endless choices overnight. Access is immediate. Distribution is immediate. Consider the immigrant who lands in the U.S. for the first time and walks into a grocery store? Or suddenly has online purchasing power at their fingertips, something they can now buy that is of value to them locally? Abundance, choice, diversity, variety – I agree that the Long Tail provides us with all of those things, and yet in the midst of all this choice and abundance, I continue to feel overwhelmed and suffocated. When I lived in the third world – and even during my stint in Europe – every day tasks were less stressful and complex. Simplicity and fewer connections were honored above numerous relationships and ‘outbound touches,’ i.e., services like MySpace, LinkedIn, Friendster, Yahoo Groups – enough already. Thanks for more choices Long Tail e-evolution, but a part of me (which gets stronger as more stuff comes my way), says No More. Enough. Certainly, this opens up the whole Attention Trust discussion and the notion that in a world of infinite choice, context, not content is king, an ongoing discussion in my industry circles. I’m not saying that I don’t welcome radio to iTunes, or a world of hits moving to a world of niches. Filters are getting better – on and offline, to help me more efficiently discover new niche products, services and people. Until it gets to a point where it frees me rather than cripples me, I remain frustrated and impatient with the process. I really resonated with his section on the dangers of ‘hitism culture,’ despite the fact that today, I can connect with Anderson and others in my generation despite our geography, economic status or education. We grew up in a hitism generation, simply because we had no other choice. With it however, comes sweet memories like The Brady Bunch, I Dream of Jeannie, Dallas, Gilligans Island, Boston and Journey to name a few. (some may disagree that these were sweet memories of course :-). Today, the tastes are so fragmented, a common conversation across one generation wouldn’t be quite the same as it was for us a generation ago. Or serve as strong reference points the way they do for us today. See my blog post on “It’s All Too Much," which will go live tomorrow. So much of the gain seems to be immediate rather than gratifying over time. How do you feel when you’re given so much choice that you now have more tasks, more commitments, more decisions to make every day, every hour? Chris talks about jam varieties and how in one experiment, too much choice resulted in fewer sales, whereas feedback from his local supermarket manager suggested otherwise. He notes that in this store alone, there were more than 300 varieties of jams and Starbucks has over 15,000 coffee varieties. How exciting to have tomato cinnamon clove and pear fig over strawberry and orange, but at what point does it become so daunting and confusing that it takes me four times as long to search for the item on or offline? Even with great filters, I sift through more choices, read more reviews, data on how it works or differs from other like-products. My supermarket experience, which I write about in detail in tomorrow's “It’s All Too Much” post, left me feeling so overwhelmed that I remember slowing down to a snails pace when I entered a grocery store for the first time after living in the Third World. Longing for fewer choices and the need to make less decisions, I left not knowing whether I got the right item or not. Did I mention that this was more than fifteen years ago? Of course I assimilated back into the world where I was originally conditioned and once again, it became the ‘norm.’ The question is not whether we can assimilate to a world with more choices and a growing niche culture, but how it makes us feel ‘over time’ about our environment and whether it erodes at the human side of our daily lives. Anderson points out however that a world of niches is indeed a world of abundant choice, and that powerful guides in the forms of recommendations and other filters have emerged to encourage more exploration not less. I think the benefits of this statement are clear: “this is the end of spoon-fed orthodoxy and infallible institutions, and the rise of messy mosaics of information that require – and reward investigation. Truths? Maybe. Good for us over time? Hard to say. I’ll end with this Barry Schwartz quote, which I referenced earlier this week, but its so good and relevant, it is worth repeating. Client KnowNow gets a plug in eCommerce Times this past week regarding their win with Wells Fargo and CIO does a significant write-up, including an interview with KnowNow customer Phoenix Technologies. Client KnowNow, announced the deployment of Wells Fargo today at the Gartner Summit. Wells Fargo’s deployments, one through KnowNow’s hosted service and one through an on-premise installation of KnowNow’s Enterprise 2.0 solution suite, are connecting key business managers with relevant, critical information the instant it is published and enabling those business managers to drive change. The two deployments are examples of how syndication technologies like RSS can be deployed within an organization to solve different types of business problems. It's a great best practice industry example of how enterprise RSS can syndicate information that originates both inside and outside of an enterprise firewall. This demonstrates how RSS can be used within the enterprise to mobilize non-RSS enabled information that has traditionally been locked in siloed applications and databases. Using KnowNow, Wells Fargo continuously watches information across multiple data warehouses to ensure that customer data and warehouse schemas are consistent. Whenever inconsistencies are identified, KnowNow automatically notifies the appropriate business analysts and the necessary adjustments are made immediately. An essential capability that KnowNow uniquely provides is its ability to syndicate RSS data – as well as any enterprise information that is not in the RSS, Atom, or XML formats. Wells Fargo has also deployed a hosted version of the KnowNow Market Intelligence solution to drive brand awareness. The KnowNow Market Intelligence solution automatically monitors a broad range of public RSS feeds to determine Wells Fargo’s share of voice in the electronic media, as well as customer perceptions of the Wells Fargo brand on the Web and in the blogosphere. Instead of Wells Fargo employees repeatedly and manually searching the Internet for mentions of the company – and finding many irrelevant results that do not impact those employees’ specific marketing functions – KnowNow Market Intelligence continually and automatically watches the Web for topic-specific information that employees define once. When new information about Wells Fargo is published to the Web that matches employees’ filtered criteria, KnowNow notifies the appropriate employees immediately. The instant notifications increase Wells Fargo’s responsiveness to critical market information. Marketers are now able to better capitalize on opportunities by adjusting business plans and related marketing decisions.